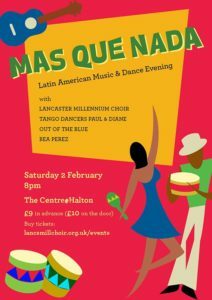 Some tickets are still available in the Coffee Shop for Mas Que Nada perfomed by the Lancaster Millennium Choir on Saturday, 2nd February 2019. On the night tickets at the door will cost £10. The Lancaster Millennium Choir is dedicated to entertaining and amusing its audiences. We have been singing original material created by our director Andy Whitfield since 2000. This year we are spreading out and hope to find new audiences around Lancaster. We are bringing to you a new programme of Latin American music – Mas Que Nada -by the likes of Jobim, Tito Puente and Baden Powell. The choir is accompanied by the Out of the Blue trio, and have a special guest in Bea Perez who will give us some of her enchanting South American folk songs. Not only that, we also have tango dancers Paul and Diane with us. 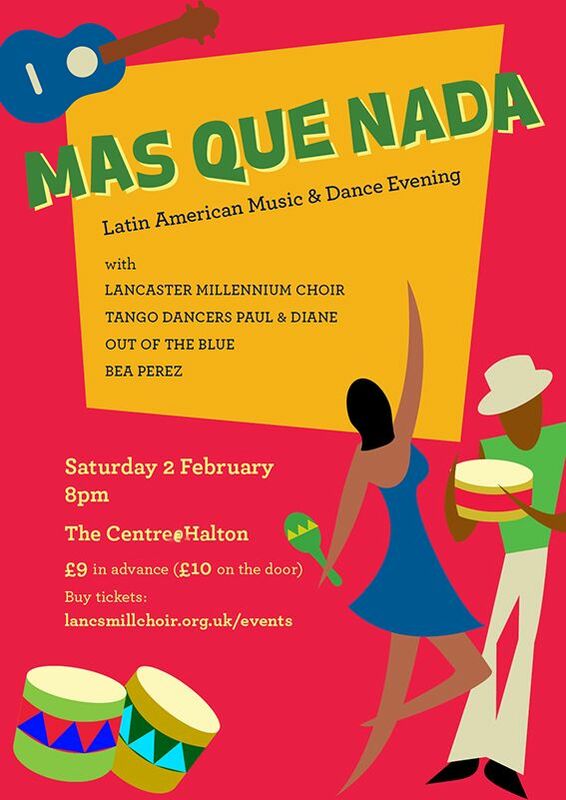 We hope there is something for everyone in this programme, and look forward to greeting the citizens of Halton with some proper Latin rhythms!